The FCI Standard for the Coton De Tulear is so written – COLOUR : Ground colour : White. A few slight shadings of light grey colour (mixture of white and black hairs) or of red-roan (mixture of white and fawn hairs) are permitted on the ears. On other parts of the body, such shadings can be tolerated if they do not alter the general appearance of white coat. They are however not sought after. 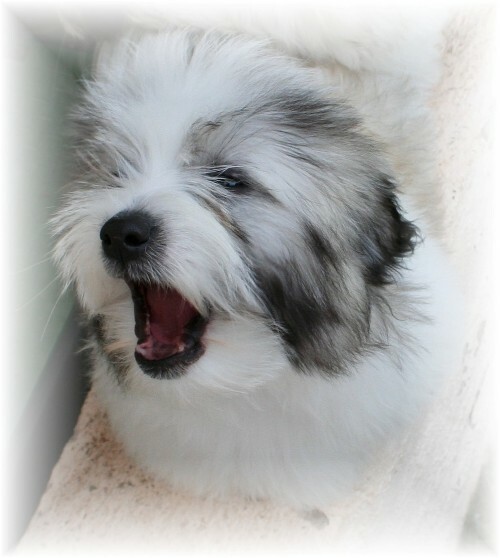 HOWEVER – Many Coton De Tulear puppies are born with lots of color!!!! And… Many pet owners Love the color in the puppies and wished it would stay as adults. Coton De Tulear puppies are born either all White, White with patches of Champaign color through the hair and there is the tri-color … which can have Black, Brown or a Brown – Rust color and White. Most Coton puppies born with color will loose most of the color as they get older. The color lightens to almost White with the Black changing to White and small patches of Grey. The Brown color often fades to a white / off White with a light Champaign Color. The Brown –Rust color typically does not fade nearly as much as the Brown or Black. There are Coton De Tulear puppies that don’t loose any of the Color… and this is incorrect to the FCI Standard for this breed, therefore these Coton De Tulears would be penalized in the show circuit for too much Color. The Color issue of the Coton De Tulear has created problems among many breeders and Coton De Tulear Clubs. What one breeder considers a small amount of color, another breeder believes it is too much color… A Champaign color may appear very noticeable to one breeder or to a judge in the show circuit… Yet another breeder or judge may see the color as very slight. Perhaps Each of Us…. Truly see things very different and shades of color is no exception. You See…. Beauty is in the Eyes of the Beholder! !